Monday’s opening session was a complete success. Conference delegates, exhibition visitors and exhibitors from around the world gathered in the stunning venue of Ny Carlsberg Glyptotek to meet and mingle. 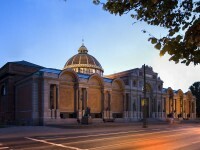 This year’s venue, Ny Carlsberg Glyptotek, was founded by Carl Jacobsen. The Glyptotek is a museum of the ancient cultures of the Mediterranean as well as Danish and French art from the 19th century. The aim of the founder was to enrich his fellow citizens with art of international stature.